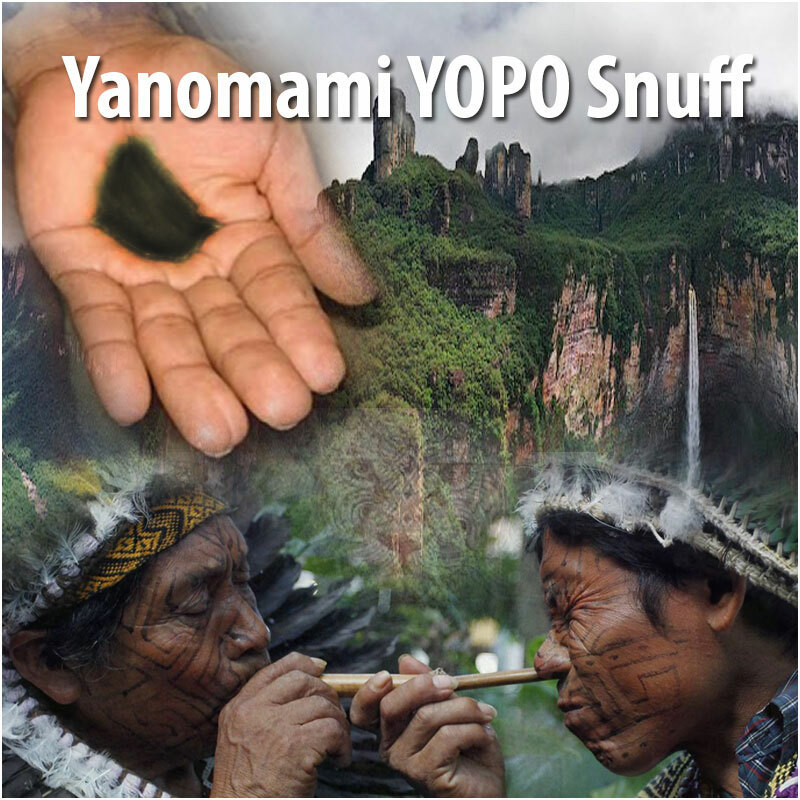 We are proud to be only supplier of the original Yanomami YOPO Snuff per 1 gram. Traditional snuff preparation by an Venezuelan Shaman. We are the only supplier for this power product. This is not party stuff! So dont mistake this with the commercial snuff you see on other websites. The Yanomamo (Yah-no-mah-muh) also called Yanomami, and Yanomama, are deep jungle Indians living in the Amazon basin in both Venezuela and Brazil. The Yanomami are believed to be the most primitive, culturally intact people in existence in the world. They are literally a stone age tribe. Cataloged by anthropologists as Neo-Indians with cultural characteristics that date back more than 8000 years, these are a Last Encyclopedia. They have never discovered the wheel and the only metal they use is what has been traded to them from the outside. Their numbering system is one, two, and more than two. They cremate their dead, then crush and drink their bones in a final ceremony intended to keep their loved ones with them forever. They are hunters and gatherers who also tend small garden plots. They are one of the most successful groups in the Amazon rain forest to gain a superior balance and harmony with their environment. The Yanomami use an hallucinogenic drug (snuff) called Yopo. The yopo is taken by being forcibly blown into the nasal cavities by another person by means of a long pipe like object. After they have achieved a trance state, they communicate with the spirit world and relate what they are seeing with chanting and dancing. For several years we sell the original yopo seeds and edible lime. With these components you can make your own snuff, but unless you add the right amount of lime your experience is a pale shadow of what the seeds can do. Many who dont get it right may find the experience novel yet some what worthless while. From now on you can order the original ready to go yopo snuff here. The snuff is 75% roasted cebil seeds powder + 25% very finely powdered snail shells. This is the amazonian formula. The snail shells are not just powdered, they are treated specially to get them very finley powder, this mix is not something that anyone can do at home. Water is also used in the process to make the cake that will be later powdered. The experince has all the magic elements of ayahuasca its quite amazing. Although yopo can have a powerful effect by itself, when combined with Banisteriopsis caapi its effects are potentiated. This happens because the vine contains MAOi (monoamine oxidase inhibiting), a chemical compound that our own body produces in order to break up substances such as DMT, allowing thus, the DMT to remain much longer in the system. The Yopo snuff also contains a combination of Bufotenin, and 5-MeO-DMT, molecules that are similar to DMT in chemical structure and produces a visionary experience. Warning! Sniffing 500mg at once is a crazy thing! One should start with 1/8 of a gram and then start raising it if needed. A gram will last for the whole night sniffing several times. Use a plastic tube. The yanomami way is to fast the day you will take the snuff, and only ingest water and fruit juices, and the trip must take place in the night, in a dark area, preferably in a good setting in the woods. ENHACE THE TRIP: IF INSTEAD OF SNIFFING, THE SEEDS ARE INSUFLATED BY SOMEONE ELSE THE DISCOMFORT IS HIGHLY REDUCED. TO INSUFLATE USE A 1 METER CAIN WITH NO NODES (OR A PLASTIC TUBE), BLOW STRONGLY AND SHORT. I have tested many of these snuffs from smartshops. This one is very good and original straight from the jungle. Hmmm i had to test it. And yes it is genuine snuff. Good job! Visually metaphorical! Proper curing of the grounded seeds. Great Quality Product! Well, I hesitate to say this but although the fragrance of the incense is wonderful - my compliments to the shaman - it appears to me to be far more interesting when actually set fire to in a glass container with some water in the bottom. . . Very good however. I could not believe this was the real thing. Thank you shamanic extracts for this quality product. I think you are the best ethnobotanical service around. I was totally in trance, i was listening to GOA trance when this snuff took control of my mind and body. All in one word: Amazing! Unbelievable! Amazing 5-meo-dmt experience with just 1/8 of a gram! My body doesn´t reject the substance, as with other kinds of psychotropics.I can only say this is the real thing. Use a good plastic tube and keep this snuff dry! This snuff is the best i have tried in years. I make my own yopy snuffs for 4 years now. This one came in very fast and overwhelming. Both opened & closed eyed hallucinations beyond expression. Be careful! Just use a little bit, it burns, it is pure power. Share your experience about Yanomami YOPO Snuff with other customers. Submit your tips or thought on this product, be detailed and specific.